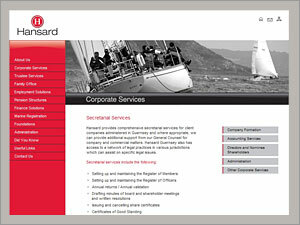 Hansard Limited licensed Guernsey fiduciary services company. Web design by Bazil. The range of Hansard Guernsey financial services include: trustee services, corporate services, family office, employment solutions, pension structures, marine and aviation, offshore companies, foundations and comprehensive company and trust administration. As an owner-managed 'boutique' Guernsey trust company, Hansard is able to provide truly independent fiduciary services in collaboration with other trusted service providers. Site developed, hosted and maintained by Web Design by Bazil.